As we see throughout scriptures, whenever, Israel disobeys God, he gives them over to their enemies in judgment for their sin. As the people cry out to him, he sends or raises up someone to bring deliverance. Israel relationship with God is an interesting one; you would think with all their struggles they would have learnt their lesson. Mans nature is fickle, Israel’s behavior illustrates this aspect of our makeup, we tend to forget all too quickly the goodness of God. God relationship with Israel follows a set pattern; the people worship foreign Gods and false idols which anger God: Yahweh in Hebrew. Once peace was regained, for a time Israel does right and receives God’s blessings, only to relapse into evil behavior, repeating the pattern set forth above. God is forgiving and compassionate, he forgives countless times, but he also chastens those he loves. Samson was one of the last judges of Israel, judging from about 1095-1075 B.C. Who were the Judges: They were divinely inspired leaders whose direct knowledge of God allows them to act as leaders, prophets and messengers for Israel. They would be the liaisons between the people and all opposing powers during periods of oppression by foreign rulers. This cycle happens about seven times between the conquests of Joshua until the time of Samuel. Samson lived towards the end of this 350 year period and is the last judge mentioned in the book of Judges. There were twelve judges in total, representing the twelve tribes of Israel. Some had major roles and offices, in the Book of Judges they were divided into two groups, the major and minor judges. Quite a length of time and history involved, many generations of Israelites carried on in the same pattern. Mankind, to a large degree has behaved in predictable fashions for ages, it doesn’t matter how many times we teach, some people still disbelieve and some will continue to do evil. God gave Samson special ability to accomplish his mandate; he was the strongest man that ever lived. His supernatural strength was given for a reason. It was to be used to enable him to fight for his people, to protect them from attacks, to establish his people and bring them to God, through his example of servitude. Samson’s fight with the Philistines was largely personal and not out of concern for his people. God’s most important asset after his word is people. God acknowledges those who acknowledge him. I say this because the Philistines had their own Gods, so God left them to their own devices. We must remember too, that the Bible teaches that those who hate God’s chosen are his enemies and he will fight against such people. When the angel came he stated that “the child was not to drink wine, cut his hair or touch a dead body” (13:3). Samson’s strength was in his covenant with God, what the angel delivered was indeed a covenant relationship, which would only be successful if Samson kept the agreement. Samson would eventually lead a life of excess, thereby wasting his talents and fulfilling his own lusts. Many times in life, we make decisions that change the trajectory of our destiny. Samson adamant decision to marry a Philistine girl, against the wishes of his parents would impact his life forever. When his young wife was killed, it pitted Samson against the Philistines in a personal vendetta. Samson priories became skewed from that moment on, and his focus was broken. He began frequenting prostitutes, a man chosen and given so many talents, leadership and divinely appointed lost his way. The enemy of mankind never rests; behind the scenes he was destroying a life that was full of promise. Maybe Samson wanted to bury his sorrows, maybe he felt unworthy after the death of his wife. Why did he not remarry? Why did he not repent? Did he ask God to heal his broken heart? Valid questions that the Bible does not answer for us, Samson was low in spirits to sort the company of prostitutes. 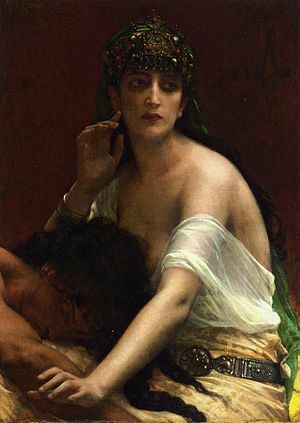 Delilah: is a Philistine harlot, and her mission was to trick and capture Samson for the Philistines. Her only loyalty was to the coin and the Philistines her own people. Delilah was a seducer, a trickster and someone who was involved in the dark arts. She bewitched Samson, so that he made stupid mistakes. We must remember that Samson was very strong, ‘he wrestled and killed a lion’ Judges 14:5–6, when the Philistines came upon him, they would come, as an army. This happened about three or four times with Delilah present after she had sold him out. So either Samson was stupid, arrogant, confident in his ability to escape, or he was under some sort of bewitchment. He eventually, told her his secret, which she promptly used against him. Samson was an obstinate and strong willed man, he was not humble and extreme hubris dogged his footsteps. He strayed from God; Samson did not walk close to God for most of his life. It was towards the end, when he lost everything including his eyesight that he restored his covenant with God. This story is an example of how Satan can interrupt and destroy a life, if we are not careful to walk in divine revelation. Samson’s tenure was twenty years but he left little to show for his time in office. He frustrated the Philistines though, thwarting their attempts to totally dominate Israel.